The idea that the Obama administration has the budget deficit under control is a complete and total lie. According to the U.S. Treasury, the federal government has officially run a deficit of 589 billion dollars for the first 11 months of fiscal year 2014. But this number is just for public consumption and it relies on accounting tricks which massively understate how much debt is actually being accumulated. If you want to know what the real budget deficit is, all you have to do is go to a U.S. Treasury website which calculates the U.S. national debt to the penny. On September 30th, 2013 the U.S. national debt was sitting at $16,738,183,526,697.32. As I write this, the U.S. national debt is sitting at $17,742,108,970,073.37. That means that the U.S. national debt has actually grown by more than a trillion dollars in less than 12 months. We continue to wildly run up debt as if there is no tomorrow, and by doing so we are destroying the future of this nation. This is the greatest government debt bubble in the history of the world, but very few people seem to have any desire to do anything about this anymore. We are literally gorging on debt, and most Americans seem to think that it is just fine and dandy. Perhaps that it is because we have never really experienced any serious consequences for going into so much debt yet. But when it comes to running up debt, a day of reckoning always comes eventually. And the absolutely insane spending policies of this administration and this Congress are hastening the day when our day of reckoning will arrive. -The U.S. national debt has increased by more than 7 trillion dollars since Barack Obama has been in the White House. By the time Obama's second term is over, we will have accumulated about as much new debt under his leadership than we did under all of the other U.S. presidents in all of U.S. history combined. -The U.S. national debt is now more than 5000 times larger than it was when the Federal Reserve was first established in 1913. -If the U.S. national debt was reduced to a stack of one dollar bills it would circle the earth at the equator 45 times. -Right now, the United States already has more government debt per capita than Greece, Portugal, Italy, Ireland or Spain. -In August, the average rate of interest on the government’s marketable debt was 2.028 percent. In January 2000, the average rate of interest on the government’s marketable debt was 6.620 percent. If we got back to that level today, we would be paying well over a trillion dollars a year just in interest on the national debt. -At this point the U.S. government has accumulated more than 200 trillion dollars of unfunded liabilities that will need to be paid in future years. In other words, we have made more than 200 trillion dollars worth of promises that we do not have money for yet. Thomas Jefferson once said that "the principle of spending money to be paid by posterity, under the name of funding, is but swindling futurity on a large scale." What we are doing to future generations is absolutely unconscionable. We are stealing trillions upon trillions of dollars from our children and our grandchildren, and we are willingly consigning them to a lifetime of debt slavery. I have said this before, but it bears repeating. If future generations get the chance, they will look back and curse us for what we have done to them. And shame on anyone that would dare to suggest that we should continue to run up more debt that future generations will be expected to repay. But government debt is far from the only massive debt bubble that we are dealing with as a country. 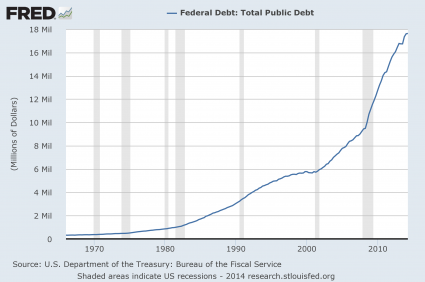 40 years ago, the total amount of debt in our nation (all government debt plus all business debt plus all individual debt) was sitting at a grand total of about 2.3 trillion dollars. Today, that total has grown to 59.4 trillion dollars. If you were to take all forms of debt in our country and divide it up equally to each person, the average family of four would owe approximately $735,000. This is not anywhere close to being sustainable, but most Americans don't seem to care. They just continue to recklessly run up even more debt. However, there are signs that we are starting to hit a wall with all of this debt. For example, an astounding 35 percent of all Americans have debts that are so overdue that they have been referred to collection agencies. 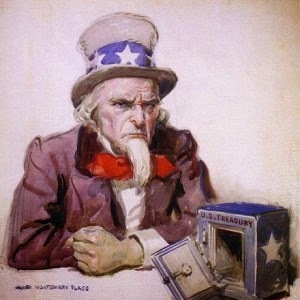 Our nation has become an ocean of red ink from sea to shining sea, and the only way to keep the bubble from bursting is for the total amount of debt to continue to grow much faster than the overall economy is growing.Obviously this cannot happen indefinitely, and when this house of cards comes crashing down it is going to be absolutely horrific. For much more on all of this please see my previous article entitled "The United States Of Debt: Total Debt In America Hits A New Record High Of Nearly 60 Trillion Dollars". 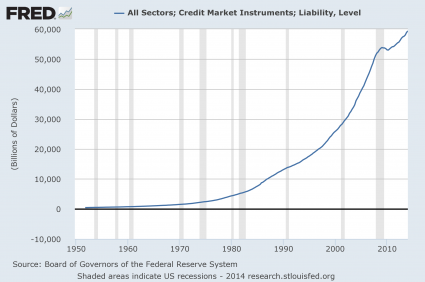 The big question is how long our "bubble economy" can keep going before it finally collapses. It has long been our view that over the last couple of decades the global economy has rolled from bubble to bubble with excesses never fully being allowed to unravel. Instead aggressive policy responses have encouraged them to roll into new bubbles. This has arguably kept the modern financial system as we know it a going concern. Clearly there have always been bubbles formed through history but has there been a period like the last 20 years where the bursting of one bubble has consistently led directly to the formation of the next? Essentially, our current system has been dying a very slow death. It’s running out of steam. Sadly, most Americans have no idea that we are living in a giant debt-fueled bubble that has a limited lifespan. Most Americans just assume that since the politicians tell them that everything is going to be okay that they don't need to be concerned about any of this. But every single day our debts get even larger and our long-term financial problems get even worse. Someday this bubble is going to burst and then all hell will break loose.